The man suspected of three shootings, two of which led to fatalities, during a crime spree on the Fourth of July was being transferred from Franklin County to Highland County late Wednesday afternoon. Jeffrey Ryan Holsinger, 31, was arrested late Tuesday in Hilliard, Ohio, following a chase involving multiple law enforcement agencies. After being held in Franklin County overnight, Highland County Sheriff Donnie Barrera said Wednesday that Holsinger was on his way to the Highland County Justice Center. Holsinger’s most recent place of residence appears uncertain. A 2006 Hillsboro Municipal Court record listed his address as LaFayette Street in Greenfield. During part of his alleged shooting spree, Holsinger was accompanied by a woman, who may have been with him voluntarily at first, but who later escaped him, said Barrera. Interviews with law enforcement officials and online incarceration records painted a more complete picture Wednesday of Tuesday’s chain of events and of the suspect, although Barrera said Wednesday that a motive for the shootings was still unknown. 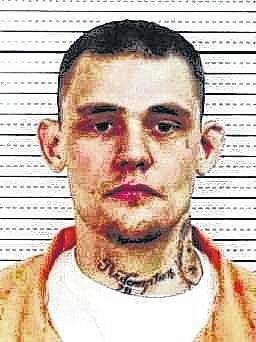 Holsinger’s arrest came after a man was found shot to death in a bathroom in a home at Higginsville near Greenfield Tuesday, along with two other shootings in Ross County, one of which was also fatal. The individual shot dead near Greenfield was identified as Steven Mottie, Jr., 35, according to Dr. Jeff Beery, the Highland County coroner. Beery said Mottie suffered a gunshot wound to the chest. Beery said Mottie has a Jefferson Street address as his listed residence. Mottie’s remains were transferred to the Mongtomery County coroner’s office for an autopsy, said Beery. Barrera said the sheriff’s office first became involved after receiving a call at around 2:10 p.m. Tuesday reporting that a man was robbed and pistol whipped in Higginsville, just outside Greenfield. Barrera said Highland County Prosecutor Anneka Collins and her assistants helped obtain a search warrant for the property. The individual who was struck on the head with the pistol was the gunshot victim’s father, Barrera said Wednesday. Barrera said that in addition to other charges that will be filed, Holsinger is charged with aggravated robbery connected to the assault on the victim’s father. Less than an hour after Highland County officials received the first report, Ross County officials received a call of a shooting. In a press release, Ross County Sheriff George Lavender said that his office received a call around 2:59 p.m. of a shooting in the 8000 block of Rapid Forge Road. The victim, identified Wednesday as Jesse Lytle, 23, was taken to the Greenfield Medical Center. Barrera said the victim was later transferred to Columbus by medical helicopter. Lavender said that deputies learned that an individual identified as Holsinger was said to be the shooter, and had stolen a green 1997 Saturn from the victim. At approximately 7:47 p.m., Ross County sheriff deputies received another call of a shooting in the 400 block of Browns Chapel Road, resulting in the death of the victim, identified Wednesday as Paul Robertson, 79, Clarksburg. Witnesses again identified Holsinger as the shooter. Lavender said law enforcement observed a stolen black Cadillac believed to be driven by Holsinger in Washington Court House, but lost sight of the vehicle after a short pursuit. The vehicle was later located on I-70 eastbound in Madison County. It was followed into Franklin County. Barrera said Wednesday that he couldn’t speculate on a motive. He said he looked forward to Holsinger being available to Highland County detectives later Wednesday for questioning. A hearing was held for Holsinger early Wednesday afternoon in Franklin County, after which he was ordered transferred to Highland County. “Hopefully, he’ll talk to us,” said Barrera. He said he also hoped to interview the woman who was apparently with Holsinger during part of Tuesday’s chain of events. Reach Gary Abernathy at 937-393-3456 or by email at gabernathy@timesgazette.com.